This photo was snapped by a friend outside of Trinity, Galveston soon after Bishop High's consecration as Bishop Suffragan of the Diocese of Texas in 2003. We were both in attendance at an ECW conference. The design I am wearing is the "A New Light Is Shining" piece (H54 in symbol jewelry) designed for the summer of 2003 national meeting of the ECW in Minneapolis. 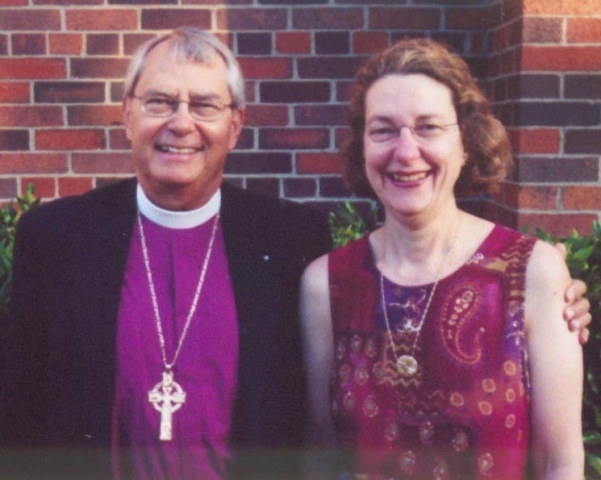 Bishop High is wearing the pectoral cross I designed and made for him just months earlier.